Are you bored of your text messages appearing in the same sort of theme every time? Do you want some innovation in the looks of texts in iOS7? Messages customizer might be a very good tweak in this regard. This release of Cydia doesn’t present plethora of features, but it allows users to make significant changes in the app. With the aid of this tweak, you can easily change the color of the bubbles appearing in the texts. You can also alter the overall settings of the messages app. It is quite possible to play with the style and shape of these bubbles, while the ability of the tweaks to associate photos with the SMS threads makes the Messages Customizer a must-have app especially for the users who have recently gained access to the jailbreak of iOS7. As your intuition goes, the configuration of the Messages Customizer has to be done from the menu that it adds to the stock settings app. 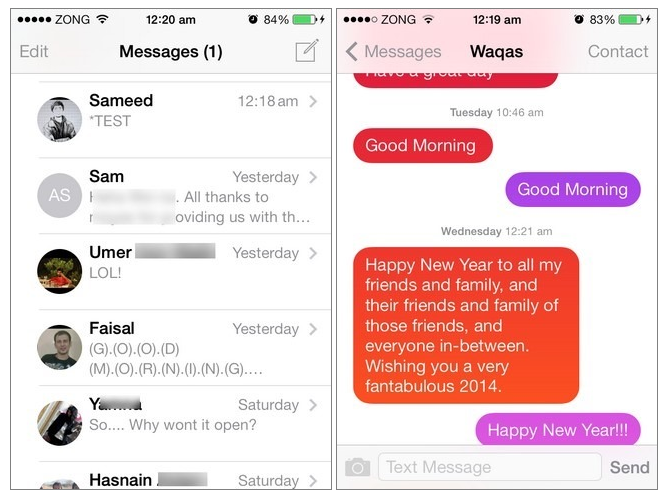 Users can select different colors for their SMS bubbles, bubbles for received messages, and iMessage bubbles. In this way, the sent messages will be differentiated in one glance only. In order to change other settings of these bubbles, the ‘Wide Message Bubbles’ and ‘Show Message Tails’ toggles can be used. 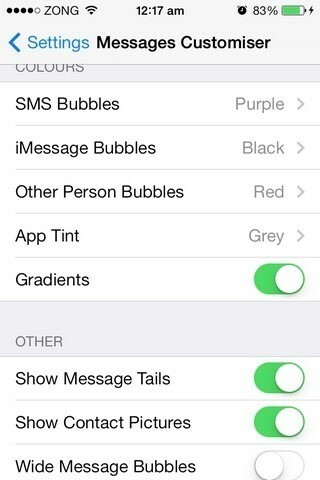 If you want to change the view of the Messages app, then the ‘Gradients’ and ‘App Tint’ options can be utilized. These features will allow you to customize the border color of threads and main screen of apps. Speaking about threads, the tweak lets to add a bit more flavor to them by adding the picture of contacts with each thread. If the contacts don’t have any photo with them, then Message Customizer automatically places their initials of the name inside the circular display region. The best thing about Message Customizer is that it doesn’t allow your texts to look out of compatibility with the rest of iOS7. The colors may vary, but the overall flavor of the app of messages remains unchanged to a large extent. Some users might have the habit of changing their wallpaper every now and again and they try to match the inside of the SMS app with the springboard. For such users, this app is great for achieving their aims and fulfilling their desires. It is a free tweak and can be easily downloaded from ModMyi repo of the Cydia store.